God transforms hearts in every corner of the world, including here in Europe. He calls us to make disciples of all nations and promised to be with us, even to the end of the age. Sometimes though, when we look at ourselves and our cities, we are discouraged. We may wonder, “How does my story fit into the bigger picture?” We want to use our gifts, circumstances, skills and resources to serve God where we live and work. In light of this, Agape Europe is launching Humans of Agape, a podcast to highlight stories of what God is doing around Western Europe. We want to encourage you and let you know how God is moving and working, here and now, through believers just like you. Perhaps the Lord will use these stories to inspire you to act in new ways in your context. Maybe He wants you to find a way to partner with the people around you in order to multiply your efforts together. He may remind you that your community stretches far beyond what you can see. You may see that others are with you and for you. 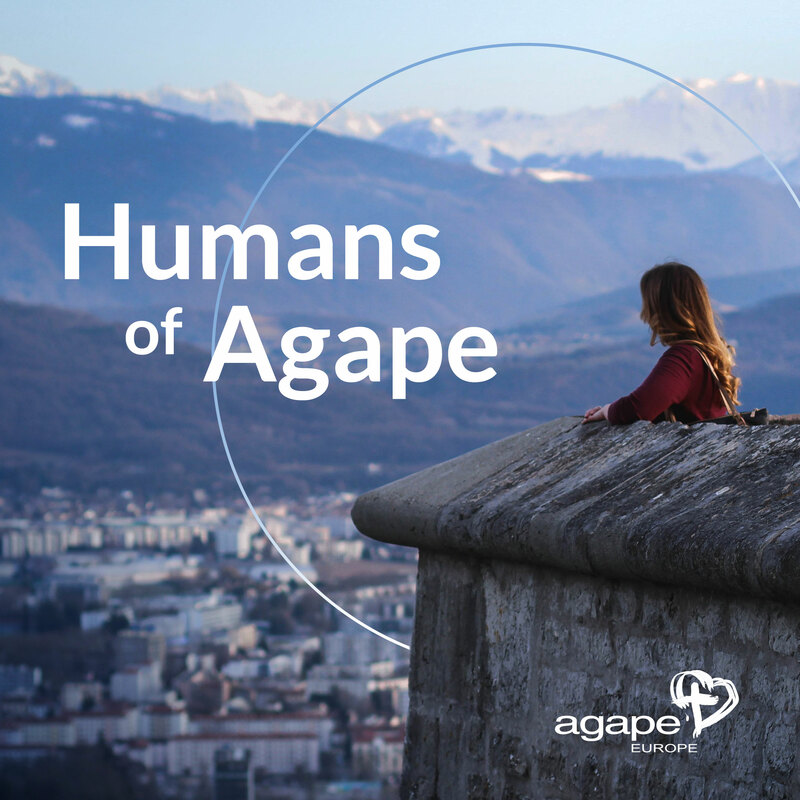 “I myself am always encouraged when I hear stories of what God is doing today, and I know that’s true for others too,” said Jochen Geck, the German staff member who is hosting Humans of Agape. Jochen serves in the student ministry in Montpellier, France alongside French and American teammates. “With a European-wide podcast in English, we could potentially encourage thousands of Christians,” said Jochen. Jochen’s guests include a cross-section of Agape Europe staff, involved in everything from campus ministry to film. We hope that this new podcast will encourage you! Start listening today. In episode six of Humans of Agape, Laurie Soliday in Berlin, Germany joins our host, Jochen Geck. Laurie is Agape’s co-national campus director in Germany and is involved in equipping student led movements in Western Europe and around the world. She shares stories of students reaching their campus, and of former students applying what they learned in student ministry to make Jesus known at their work place. She also talks about how she travels around the world to equip students and staff despite her fear of flying, because God is worthy. Tune in to this week’s episode of Humans of Agape. In episode five of Humans of Agape, Renata Ramanauskaite in Vilnius, Lithuania joins our host, Jochen Geck. Renata is Agape’s national director in Lithuania. She encourages us to do the works God has prepared. She also talks about how she sees the Gospel in Lithuanian stubbornness, and how she and her team are making Jesus known in Vilnius. Tune in to this week’s episode of Humans of Agape. In episode four of Humans of Agape, Joe Schlie in Paris, France joins our host, Jochen Geck. Joe coordinates all Agape activities in Paris, the “City of Light” and leads Agape Art. He reminds us to let our light shine. He also connects art, expression, vulnerability and the Christian life. Joe also explains what trust has to do with food and community. Tune in to this week’s episode of Humans of Agape. In episode #3 of Humans of Agape, Matteo Chiarelli in Rome, Italy joins our host, Jochen Geck. For the second episode of Humans of Agape, Dominik Schweiger in Munich, Germany joins our host, Jochen Geck. On the first episode of Humans of Agape, Allison Doolittle, the Director of Communications of Agape Europe joins our host, Jochen Geck.